We were watching the movie "Frozen" at Julie's home earlier. 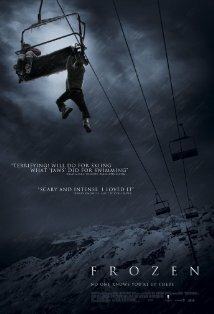 It's a movie about friends who loves skiing but for some unfortunate event, got stranded on a chairlift in the middle of a snow storm. You can just imagine the cold and frustration that these poor kids feel while left in the cold. They have to find a way out no matter what it takes than get frozen to death. While watching the film, Julie and I talked about not being able to survive the cold ourselves. Both of us suffer arthritis when we get so cold. We would badly need for treatments for arthritis if we opt to live in a country that has very cold weather. We wouldn't dare to even ski or play on the snow! LOL! We weren't in the middle of the movie yet when Judith asked us to stop playing the film. We were on the part where one of the kids decided to jump from the chairlift and ended up literally breaking both his legs! Gruesome! She doesn't like watching this kind of film, actually. Since it's her birthday she doesn't like any negative vibes! We ended up watching a romantic movie.